Zoe Saldana’s makeup secrets, revealed! Flawless. That’s the best way to describe Zoe Saldana, whether she’s eliciting double-takes on the red carpet or just running around being one of Hollywood’s most in-demand actresses (and getting snapped by paps wherever she goes). Vera Steimberg, a proud argentina, is not only Zoe’s trusted makeup artist but her close friend, so you know she has her best beauty interests at heart! I called Vera up to learn how to get Zoe’s look. De nada. “Zoe is very good about washing her face every morning and night,” Vera shares, “so every time I do her makeup I don’t have to do very much to prep her skin.” And why break the bank when you don’t have to? One of Zoe’s favorite cleansers is Cetaphil, available at most drugstores. “Whenever I work with Zoe, we have a conversation about the overall look we’re trying to achieve and we work as a team with her hair person and her stylist. If it’s for a magazine photo shoot, she may want to be more playful or dramatic. If it’s for a red carpet, we look at the dress and make sure there’s some continuity there.” At the Oscars this year, Zoe landed on everyone’s best-dressed list, and her hair and make-up were equally responsible as her romantic Alexis Mabille gown. That night, Vera used the Chanel Hydra Beauty Serum, which hydrates thanks to its Camellia flower extract, as the base of Zoe’s look, and then built from there, using mostly Chanel products. “The great thing about her is she’s not afraid to try anything,” says Vera of her superstar friend. Zoe loves her red lips, and on the night of the Vanity Fair Oscars after-party, Vera used Chanel’s Rouge Coco Hydrating Creme Lip Colour in No. 19/Gabrielle, which is creamy in texture and provides some moisture. Talk about a statement pout! Vera working her magic on Zoe the night of the Oscars. Vera likes to use Ardell individual lashes on Zoe: “They photograph so beautifully, you would never know she’s wearing them!” To fill in Zoe’s brows, which are on the thinner side, Vera prefers powder to pencil, which tends to look harsh. Her usual pick: Senna’s Form-a-Brow kit, which has three different shades. 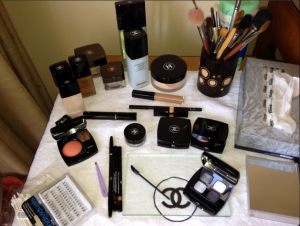 A look at the Chanel goodies Vera used on Zoe on Oscar night. « What’s the one accent Gael Garcia Bernal can’t do?